After Organ Pipe, we got back on track and headed to Yuma for my last dental appointments. One year after starting on this crazy Mexico dental journey, I now have two implants (hopefully) firmly stuck in my mouth. The implants cost me 1/3 of what the US dentists normally charge and I was extremely happy with Dr. Urena and her staff. It’s nice because she gives you an upfront total so you know exactly what everything costs with no hidden fees. The only downside of using Dr. Urena is that she’s so popular that she books up weeks in advance. Just a block away from our dentist’s office. 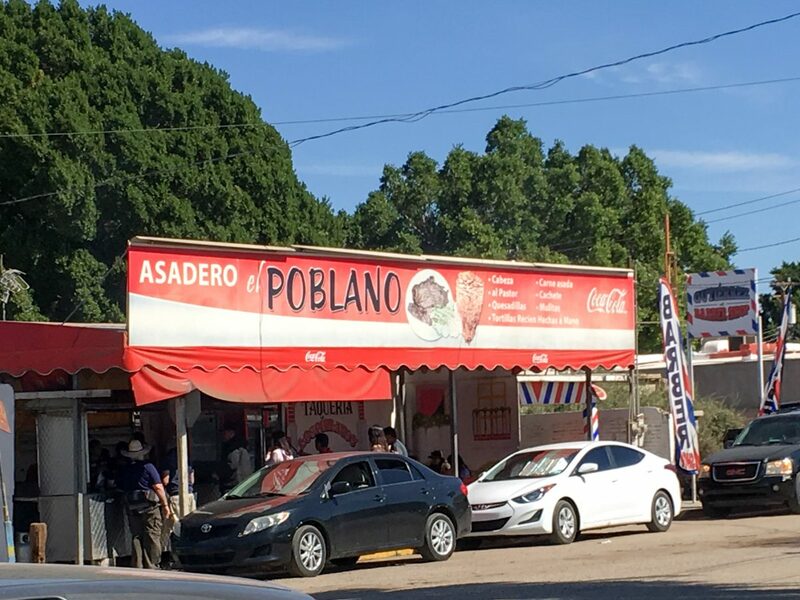 Since these last appointments involved just adding a crown to the implant, we were finally able to eat some street food in Los Algodones. Every time we’ve been here, I’ve been so hopped up on Novocain that unless I wanted to lose my tongue or lips to chewing, food was out of the question. We stopped at a nearby taco stand and it was worth the wait. 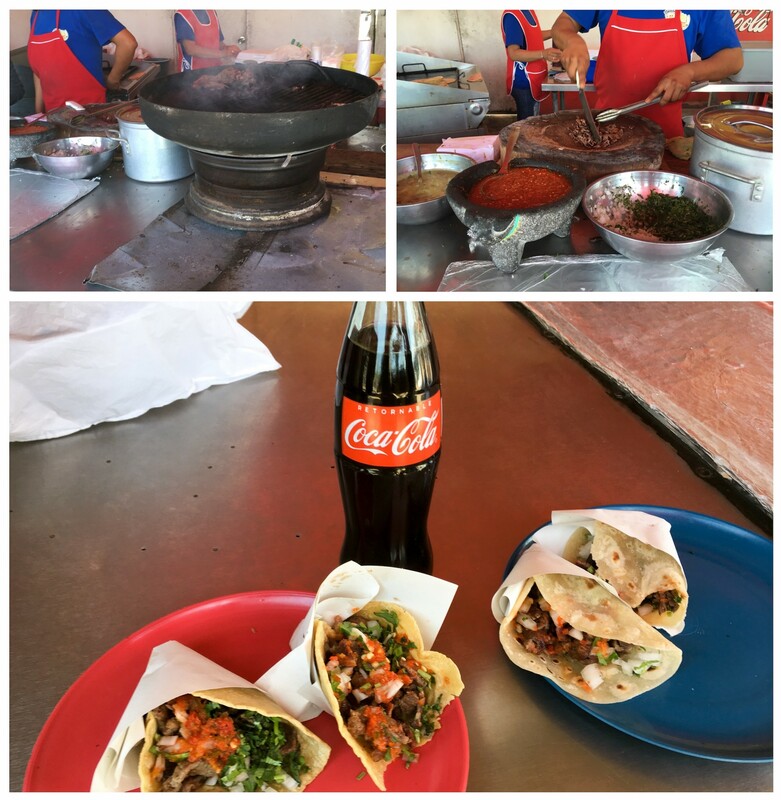 Four Mexican-style (cilantro, onions, avocado, salsa) soft tacos with carne asada, and a bottle of Mexican coke (sugar, not corn syrup) cost less than $6 and had us coming back to visit a few days later for more. 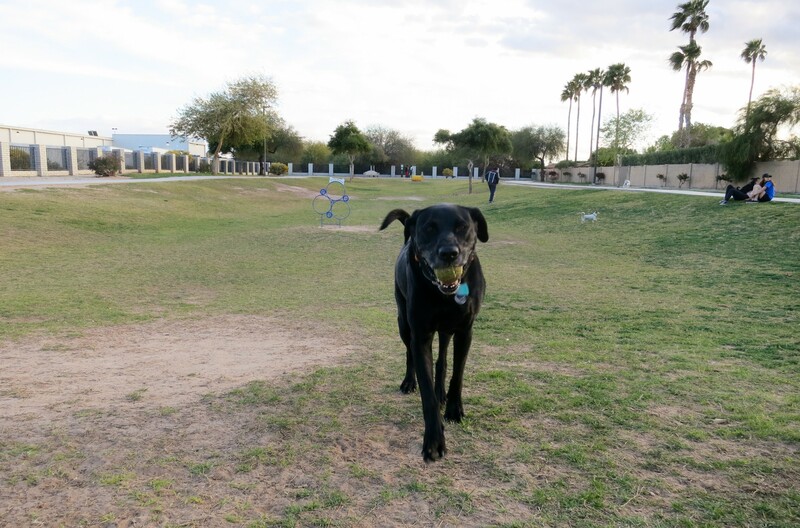 We stayed at a typical RV park close to the highway with little opportunity for Opie to play so we visited the Yuma Bark Park multiple times. The dog park has a lot of grass, a concrete walkway and water available, plus there were always dogs there in the afternoons and evenings. Opie had a grand time and made friends (actually he tried to be really good friends) with a young golden retriever, Gohan, who we saw a few times. Between the playing, chasing ball, and wrestling, we were able to expend a fair bit of Opie’s energy. Opie enjoying the Yuma Bark Park. 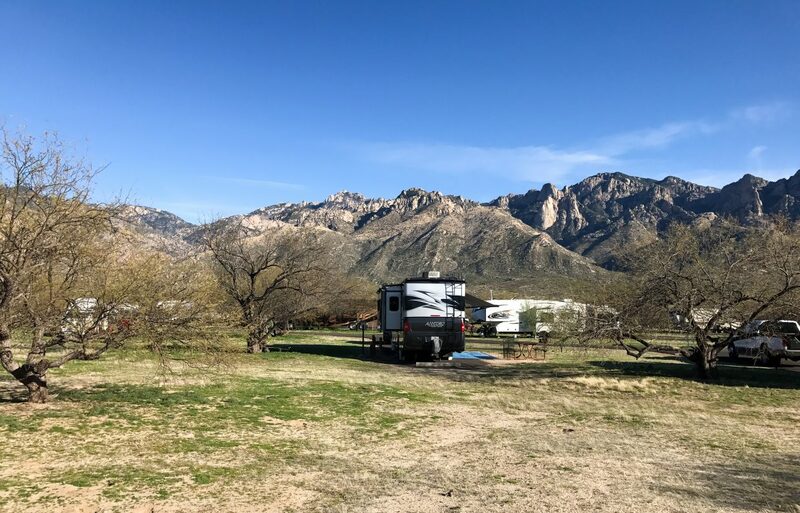 We left Yuma and headed back to Tucson since Mike planned ahead and snagged an 11-night stay at Catalina back in October. Back in Catalina, we were able to give Opie much longer walks through the park. Surprisingly there was still a little bit of water left in Sutherland Wash from the recent rains and Opie took full-advantage of what was left. Opie’s superpower is the ability to get completely soaked in less than 3 inches of water and he uses this power as often as possible. Since we had a fair bit of time in Catalina, we were able to deal with the down and dirty side (literally) of being full-timers. Folks we meet on the road often tell us how awesome and amazing our life seems and most of the time we agree with them but every once in a while it’s not so glamorous. Since we’re always on the move, when something breaks we usually can’t just bring our house in for repairs. 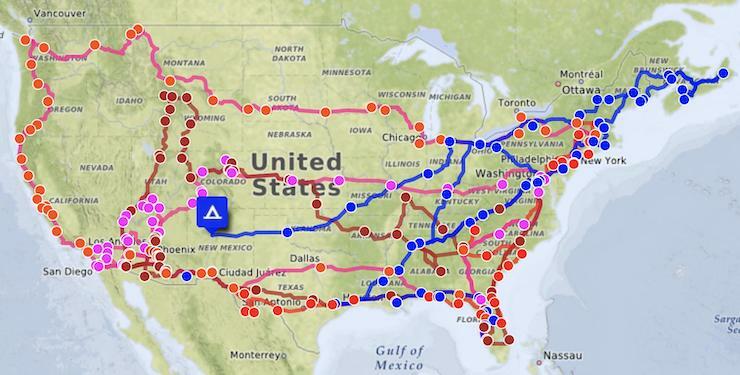 There’s a lot of google-ing and youtube-ing involved as a full-time RVer! A few things had been causing some minor issues in Rover, but we were unable to get the right parts until we landed in Tucson. A friend’s mother was happy to receive packages for us so we had been sending them her way and were finally able to get started on our repairs. Back in Texas, we noticed that our toilet would sometimes lose water. It didn’t happen often, but a dry toilet is not normal and indicates that the seals are no longer working properly. We ordered some new seals for our specific toilet and finally got down to replacing them. Originally we had only planned to replace two seals (one between the toilet and floor opening and the toilet gasket seal) but the kit came with 4 of them and directions so we figured we should replace all of them. I did take photos during the work but after I saw them, I realized that absolutely no one wants to be exposed to that kind of yuck. You’ll just have to believe we did the replacement, without any visual aids. It isn’t a difficult job and the directions provided in the kit were good so it only took us about an hour to complete the work. Tow bar rust, before and after. After three years of full-timing, our tow hitch on Rover and Red were looking a bit ragged. A lot of paint was flaking off and rust was building up on both hitches. Plus the electrical tow connector on Red had always had a loose pin, so sometimes our brake lights and turn signals in the car wouldn’t sync with Rover’s while we were towing. Mike replaced the electrical wiring harness while I cleaned up the rust and repainted the hitches. My original thought was to sand off the rust and repaint, but with all the cracks and crevices, it was near impossible to remove all the rust so I went with an easier option, the rust neutralizer. Rust neutralizer reacts with rust and changes it into a neutral compound which you can then paint over. You do need to scrape off any loose rust and paint, and clean the area of all dirt and grease before using the stuff but it’s a lot easier than sanding down to the metal. After the neutralizer dries, then I just used some Rustoleum as a topcoat. I’m cautiously optimistic but I’m also realistic that the constant friction between the tow hitches will probably strip the paint and cause it to rust again. Car baseplate rust, before and after (and new electrical connector). Driving Rover, it’s always been a little challenging when we need to change lanes or merge with traffic. We’re 55-feet long including Red, our tow car, and since Rover is wider than Red, Red doesn’t show up in either of our side-view mirrors. Figuring out when it’s safe to change lanes takes a lot of practice. Luckily, Rover has rear and side cameras to help with visibility. While driving, the dashboard video screen shows the rear view and we can easily see Red behind us and the spacing of the cars around us. But when we use our turn signals, the video changes to the side view to help you see if there are any cars next to you. Since our side mirrors already show almost the exact same view as the side cameras, we find the rear view to be much more helpful. So, Mike bought a switch and did his handyman thing to hook it up to the various camera wires. Now if we want to disable the side cameras, we just flip the switch and the rear view will stay on screen even when we use our turn signals. If we need the side cameras, we flip the switch back and everything is back to normal. It’s brilliant and makes changing lanes and merging so much easier! Our new side-camera on/off switch. Lastly we had one unscheduled fix while in Tucson. One day our water pump would no longer shut off even if we weren’t using any water. I immediately panicked and thought we had a water leak somewhere so I’m running around/inside the coach with a flashlight looking at all the pipes and hoping that I don’t find puddles of water anywhere. No leaks, no water puddles but the water pump still wouldn’t shut off. We tried lots of troubleshooting steps, each getting more and more drastic. Eventually we removed the pump entirely and hooked it up to a hose in a bucket of water, and it still wouldn’t shut off. 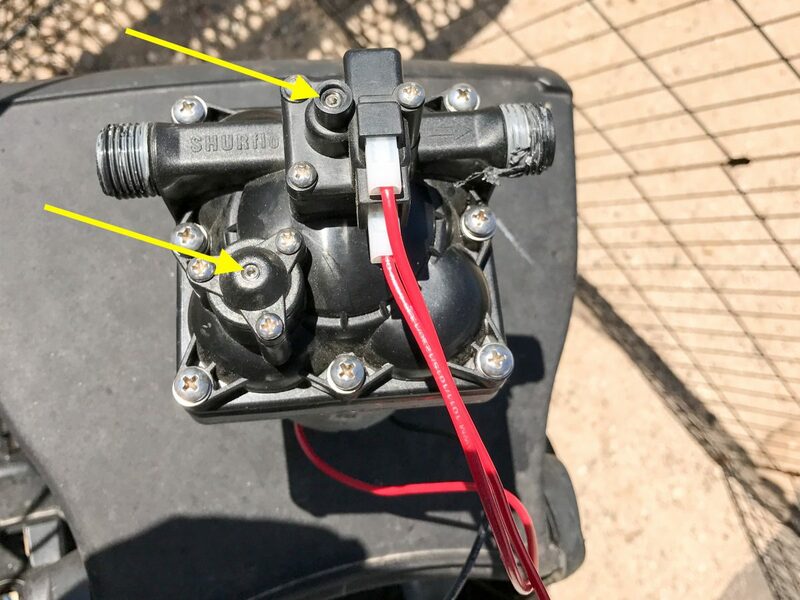 At least that told us the problem wasn’t with anything in the RV, it had to be the pump. I figured the diaphragm inside the pump must be damaged and it was time for a new pump. However Mike, with his google-fu and engineering/analytical mind, was able to track down the heart of the problem. Our water pump, removed for troubleshooting. From the pump’s instruction manual we learned that it has two adjustable settings (see yellow arrows in photo above). One is the pressure shut-off switch, normally set to 55 PSI. Once the water lines reaches that pressure, the pump shuts off. Usually this happens after you turn off the faucets and the pump finishes building pressure back in the water lines. If you turn on a faucet, the pressure drops, and the pump turns back on. The other switch sets the bypass pressure range, which was something we weren’t previously aware of. The bypass lets some water circulate within the pump, rather than being pumped through the pipes. This is done to prevent the pump from turning on and off a lot when you’re using just a little bit of water. If you’re using a lot of water (like taking a shower), the pump will run continuously and everything’s fine. But with a faucet on just a little (say, brushing your teeth), the pressure would drop a bit, the pump would turn on, but a second later it would reach 55 PSI and would turn off again, over and over. Instead of a steady stream of water from the faucet, you’d have alternating high pressure and low pressure as the pump turns on and off. The bypass lets some water flow within the pump so that it doesn’t reach 55 PSI and doesn’t shut off until you turn off the faucet, so you get a nice steady stream of water. The instruction manual mentioned that if the bypass pressure is set below the shut-off pressure, the pump will never shut off since it’ll never reach the shut-off pressure! 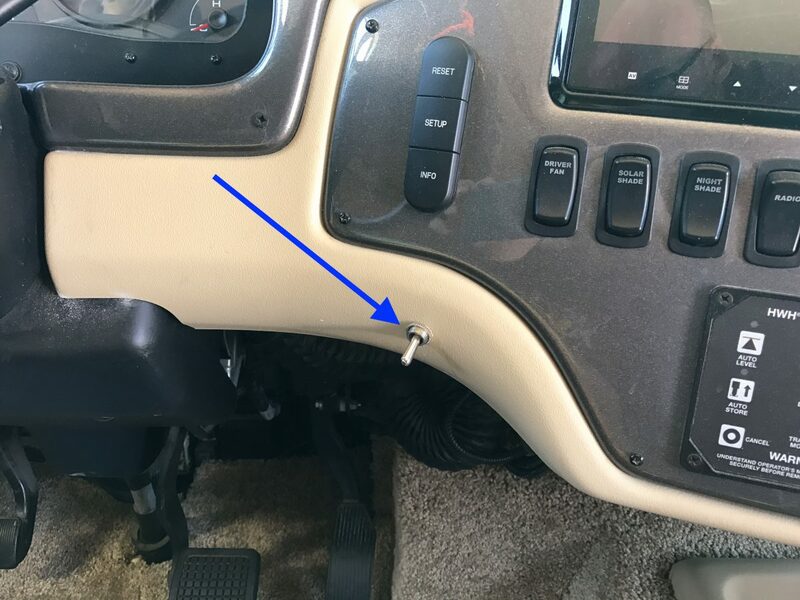 To see if this could be our problem, Mike started adjusting the two screws (there are no gauges, he just has to turn each screw a bit and see what happens). Eventually he got to a point where everything was working normally again, which means no new water pump for us! Meeting up with Steve and Mona Liza for lunch in Tucson. Between all our chores, we were lucky enough to meet up with some old friends. 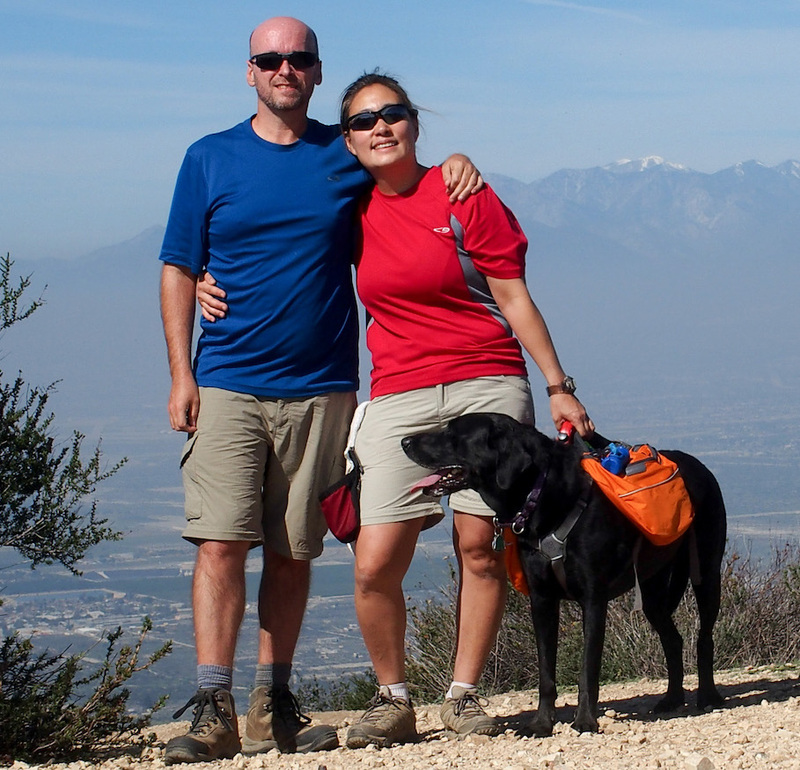 A couple of years ago, we met up with Connie and Lisa and their super-cute dog, Pepper. This year they were in Catalina for a few days overlapping our stay, so we were able to meet up again and hang out while they were testing their new solar panels and lithium battery system. I’m pretty sure Mike left a trail of drool while admiring their systems (1800+ watts of solar and 900+ Ah of lithium batteries). They have enough power to run one air conditioner just from battery, which is pretty unusual for an RV! 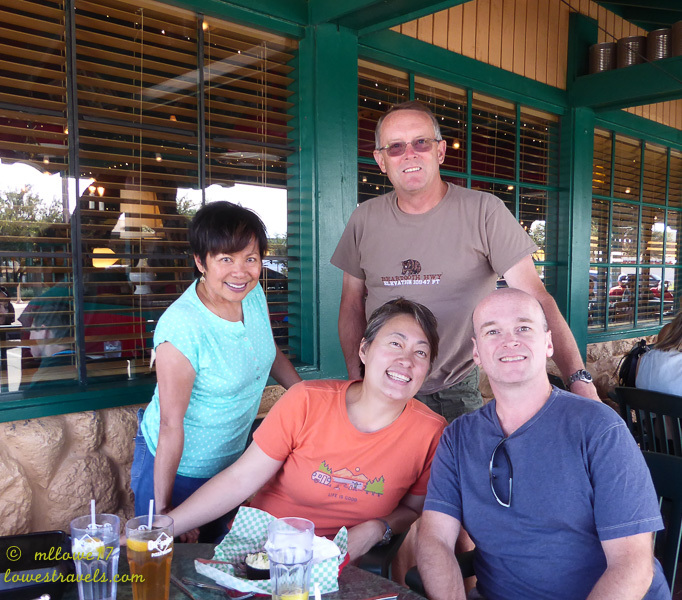 We also had lunch with Mona Lisa and Steve of Lowe’s Travels to catch up since we met them at Bryce Canyon last year. After three years full-timing we’ve hit that tipping point where we’re regularly re-meeting friends on the road which has been great for us! Since our house issues have been resolved (for now), hopefully that means we’ll do more of the fun stuff in Phoenix and Sedona! 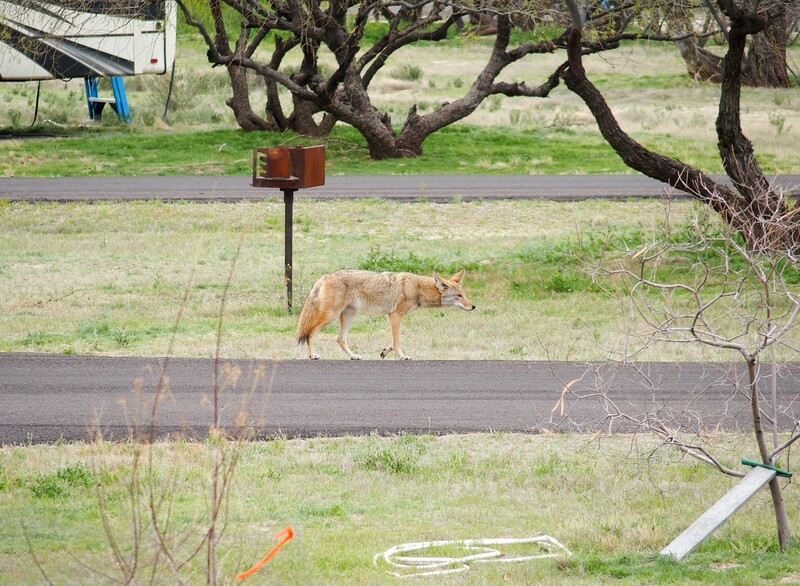 Coyotes were frequently stalking through the campground at Catalina State Park. Great description of all your repairs, and very ingenious! I especially liked the information about the water pump settings. Great seeing you guys recently. Next time we’ll try to pick a place with faster service, although if we hadn’t postponed it probably wouldn’t have been a problem – our bad. We prefer to do those get-togethers on weekday afternoons! Even though we had to wait a while for service, that just gave us more time to chat and catch up! I agree with you though, meeting on weekdays is so much nicer in general. We’ll have to do that next time we cross paths. I hope Mona Liza is feeling better and it was great to see you two again! So relieved Mike continues to find ways to exercise that mechanical aptitude and troubleshooting skillset. Seriously, that man hasn’t lost his touch! If something needs to be researched, Mike is right there and doing his thing. I agree with you about moving the house though. Since all of our stuff goes through an earthquake every 1-2 weeks, I’m guessing a lot of our stuff reaches problems much faster than most homes. The good news is that we have a lot less stuff to break in the RV than in a regular home! I read the explanation of the water pump fix with interest. Really. It’s amazing how many repairs can be completed with a thorough read-through of the product manual. I’m wondering why the need arose to adjust the bypass pressure though. Do you think the valve on the pump loosened, or that the overall system pressure has changed? That’s a good question. We think it might be due to age, we don’t think the valve has loosened, but either the diaphragm or switch inside the water pump has become less flexible with age and so the valve needs to be adjusted. This is a really helpful post. One of Kevin’s biggest pet peeves is that camera that switches when you put on the turn signal. He was planning on dealing with it at some point, but it’s nice to know it can definitely be done without too much aggravation. And we’ve also had some weird issues with our water pump. We’re not sure it’s exactly the same thing, but it might be related. We’ll check into it. The camera used to make us nutty. In really bad traffic, the navigator would have the hit the switch 2-3 times to get it to switch back to the rear view after turning on the signal. This way is SO much nicer! I’m sure Mike would be happy to give Kevin exact directions on how to make the change. Hope the water pump issue isn’t too bad though. Great job on all the repairs, it’s amazing how a little googling can assist in those repairs. I found the information on the water pump very interesting and most helpful. Thanks! We were surprised about the bypass valve so we’re glad that the knowledge can help other folks. No kidding about the googling though! 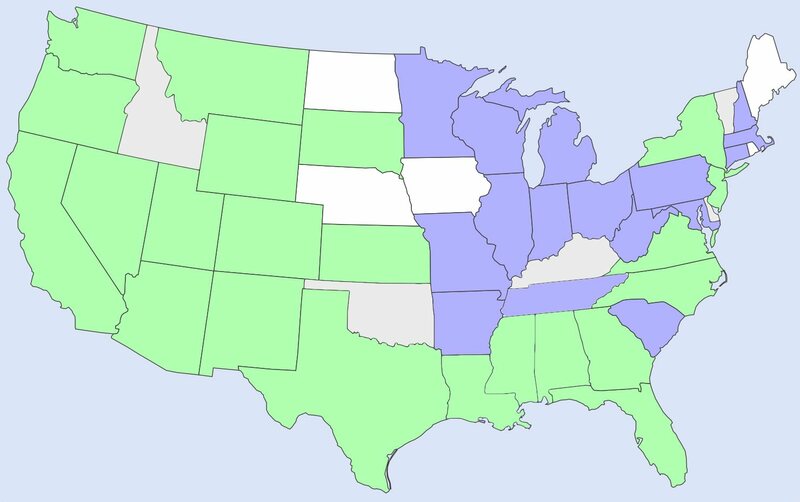 It’s amazing how much info you can find on the internet, after you sift though all the bad information.